There are inkers I would call embellishers - Klaus Janson, Tom Palmer, Kevin Nowlan, Joe Sinnott, Wally Wood, Ernie Chan being examples - and when they're hired, they're hired to do what they do (sometimes over breakdowns). Austin is much more faithful to the original line, and this style of inker is more likely to be popular with fans of the original artist. Outside of JB inking his own pencils, if you want his art as "pure" as you can get it, you hire someone like Austin. In his own way, Austin is as heavy handed as Palmer, but he's just the right kind of heavy handed for JB. Not all JB, mind you - much in the same way you'd want Kirby/Sinnott for FF and Kirby/Coletta for Thor, I don't really see Austin's precise, dense, controlled linework being a fit for JB's FF. 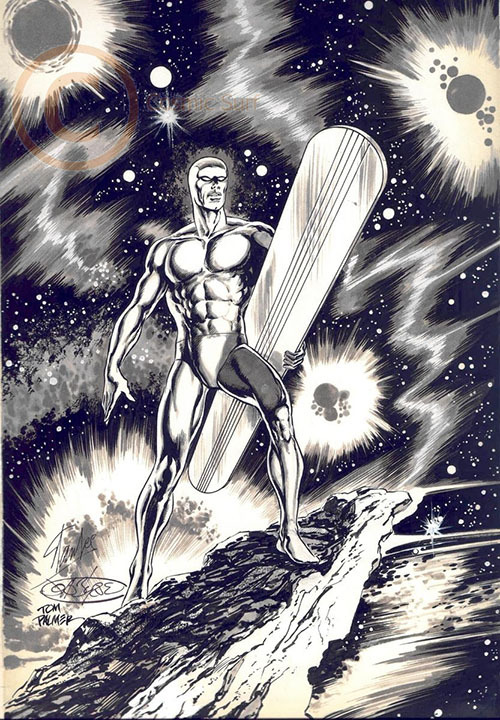 I have to say I felt that Palmer's inks overpowered JB's work in the Silver Surfer one-shot. But I found them perfectly appropriate in Hidden Years. I liked that JB was building a visual as well as a textual bridge between the Thomas-Adams stories and Wein-Claremont-Cockrum-Byrne era. I particularly liked when Joe Sinnott inked the FF elements during their guest appearance. I thought it was really creative effort to play with the possibilities of the medium as well as a nod to the historic development of the characters. That said, Palmer would not be in my top 5 folks to ink JB if any such decision were up to me. Check it out! Josef Rubinstein took a crack at this one! I love the Rubinstein! Adds without detracting. Ideal inking. Totally agree with Michael, and that's saying a lot from one of the few who were a bit more critical of Rubinstein's inks during the Cap run. That's the cover we should have gotten. I really like Rubinstein's inks here too. I can still see JB in his version. No disrespect to Tom Palmer, who is a fantastic artist, but I definitely prefer Josef Rubinstein's inks in this instance, as JB's linework and style come through clearer. I think JB's pencils, and the Rubinstein inked piece genuinely look more exciting. 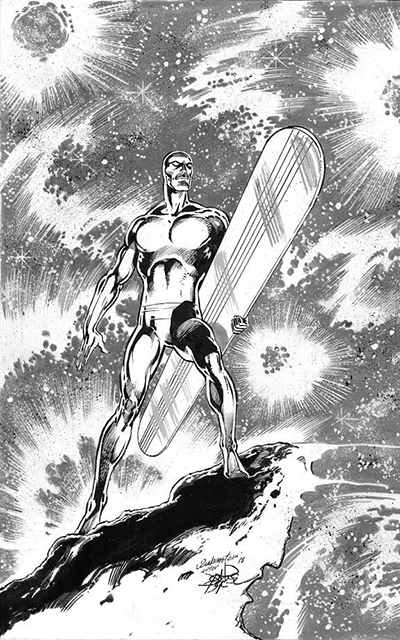 That said, I loved Palmer inks on John Buscema. That was a great pairing. Maybe he'll take a crack at some of those beautiful ELSEWHEN pencils next! inked your book, its going to look great. Its just going to look like Joe. Stephen, he inked a few JB pages on UXM back when Jim Lee was pencilling. Looked rather nice, I thought. BTW Rubinstein might be stopping by to see this thread -- I mentioned to him on Facebook that I posted the piece here. I believe this piece is a commission. Very cool piece to own! THERE are those JB light sources. Nice.